The train journey to London is often cheaper if you go a little later in the morning and it's a nice place to sit and have lunch (as long as you buy before boarding). 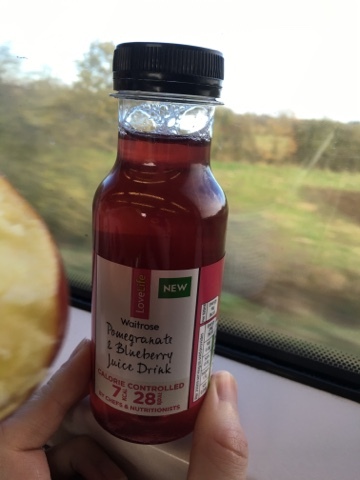 Snow Hill station in Birmingham has a lovely Waitrose right outside so not only is there an actual choice of foods, but it's a reasonably healthy selection too. I picked up this bottle for a drink - not spotting that it's essentially just water. I'd have rather just had a larger plain water in hindsight. Oh well. The main is a lot more exciting - a ham hock egg and potato salad, and the salad is a mix of fruit and veg too. It was all crispy and flavoursome, although me tipping all of the mustard dressing on it probably doubled the calories and masked the subtlety of the flavours. A whole egg was a nice touch, and the combination of quality ham and fresh peas was not something I'd have gone for normally but I just couldn't resist all that green! My only downer on the experience was I had to eat it with a spoon as they'd run out of knives and forks! I'd chose this again happily, but there are lots of similar salads in Waitrose to try. 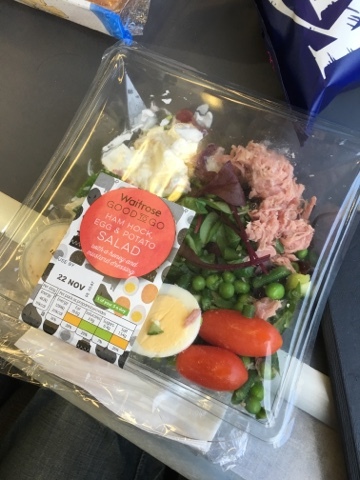 Possibly a little more expensive than many would like but certainly worth it for the convenience and tastiness of having a mixed salad as you hurtle towards the capital.